The charge controller is the beating heart of any solar energy system. Specialist experience and the desire for perfection at TSS have resulted in the most solid and most efficient charge controller for stand-alone solar energy systems. It is designed to have exceptional performance and last longer especially in the harshest conditions. The Multi Array input eliminates a single all-or-nothing connection. By providing a constant float charge the controller reduces the number of cycles increasing the lifetime of your batteries. The analogue fallback-mode kicks in should the processor ever fail. This prevents downtime & increases your ROI. Programmable for all types of battery chemistries toprovide the best charge regime available. This results in higher performance and longer lifetime of your batteries. A modular design allows for expansion when largersystems are required. Adapting the capacity to yourrequirement. No unnecessary cost for unnecessary capacity. This reduces your overall system cost. Performance, quality and durability of the modules determines the amount of energy your system can produce over its lifetime. One of the main functions is charging your batteries and for that you require as much current as possible. The voltage must be high enough to push the current to your batteries even when they are almost fully charged. The solar module has a junction box for both parallel and serial connections. No sub-array junction box needed and less cabling is required. Use of selected European high quality products guarantees high performance and durability. 10 years performance warranty 90%. 25 years performance warranty 80%. Available as Monocrystalline modules or Polycrystalline modules. Your off-grid solar energy system is vital for keeping your production going. You want to know everything about your system’s status and what is to be expected. The Nanodac provides you with all of this information so you can optimize production, improve efficiency and extend the life time of your solar energy system. Incredibly clear visualisation of process parameters. In the blink of an eye your system's status is available and clear. Up to 34 data parameters from the controller can be read and processed. System information can be safely archived for up to 2.5 years. Parameters and stored data will help you analyze events and system status, keeping your systems health and performance at the highest level. This premium DC/DC converter gives you a solid 24Vdc or 48V (±1%), protecting your loads from over or under voltage damage. The high power, high efficiency characteristics make the Σ-Ahr Stabilizer your best choice for sensitive loads in harsh environments. Low losses reduces the number of additional solar modules required, keeping overall system costs as low as possible. State of the art design and choice of components make it a solid and extremely reliable converter. 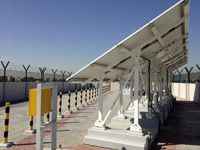 Solar energy systems operate in the hottest environments. Temperatures inside the control box can easily exceed 75°C. The Σ-Ahr Stabilizer is designed to operate up to 85°C without forced cooling! The Σ-Ahr Stabilizer can handle loads of up to 1320W while taking less than 1 dm3 in space minimizing your enclosures, lowering your costs. The Σ-Ahr Stabilizer can be used for multiple & mixed load types like motors, solenoids, capacitators, valves, etc. 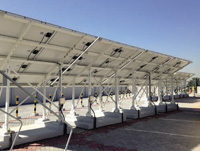 The modular TSS solar array support structure is a flexible solution for stand-alone solar systems of all sizes. Rigid and easy to install it is the solid foundation for your solar energy system. The smart design of the support structure contributes to overall cost reduction and extends reliability of your solar system. Modular design starting at 4 solar modules. Adjustable tilt angle from 10° to 60°. Available for different type of solar modules. The support structure can be produced in HDG steel or stainless steel (304 or 316). A standard epoxy powder coating or a project specific coating can be applied. Integrated facilities for mounting control equipment eliminates the need for separate control racks and facilities for cables.